Successfully securing itself as a room game changer this season is the statement rug. Area rugs of this calibre are ones of large proportions, bold patterns and out-there colour choices and can take your space from nought to 100 in less than two second flat. Rethink your flooring situation with inspiration from top interior designers and some of their most daring flooring ventures to date. Jeff Andrews is no stranger to ultra-glam residences (or clients) so one shouldn’t expect his flooring choices to be anything less than. 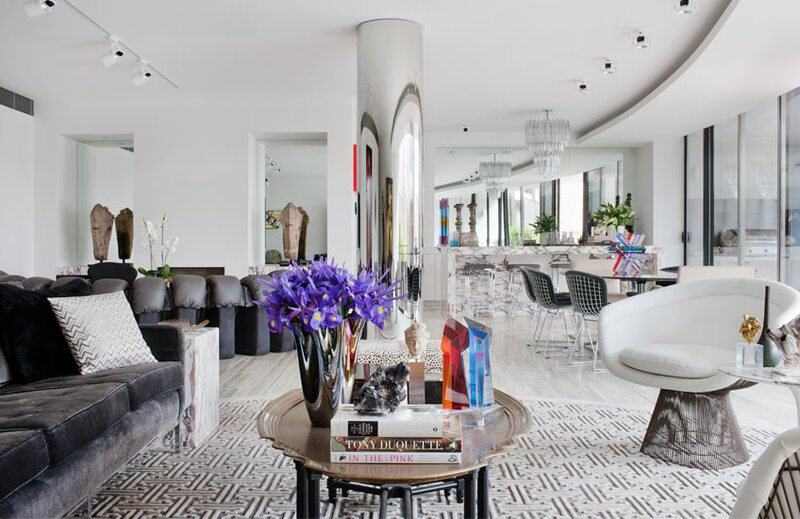 His dynamic design for Kourtney Kardashian’s previous home featured a black and white Viesso rug in a playful chevron pattern as the foundation of the formal living room. The black and white vibe continued through to the reality star’s chequered coffee table and wide striped walls. An impressive pendant light collection of Moda suspends from the ceiling with high-spirited turquoise and hot pink adding interest via fun accessories. A west London René Dekker living room is grounded by an ikat-inspired Tai Ping rug in tones of aubergine, blush and stone. 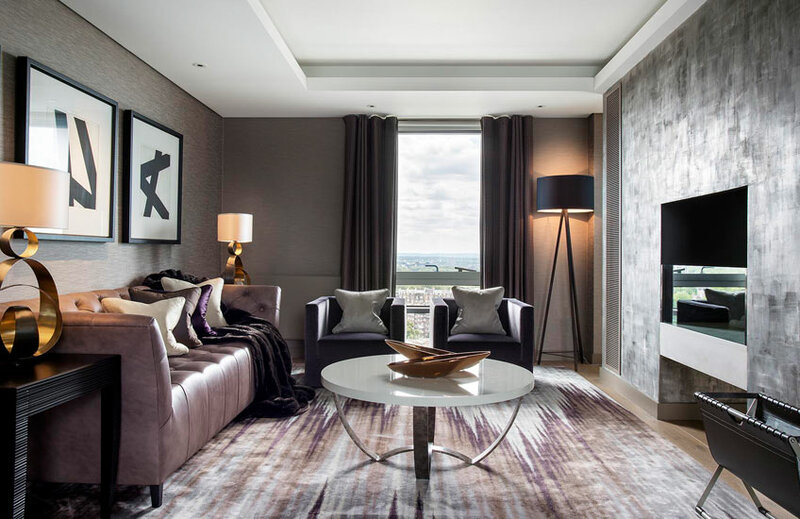 Encapsulating the room’s colour palette, the rug unites the room’s mauve button-tufted sofa, matching armchairs, lilac-grey polished plaster fireplace wall and Porta Romana coffee table. 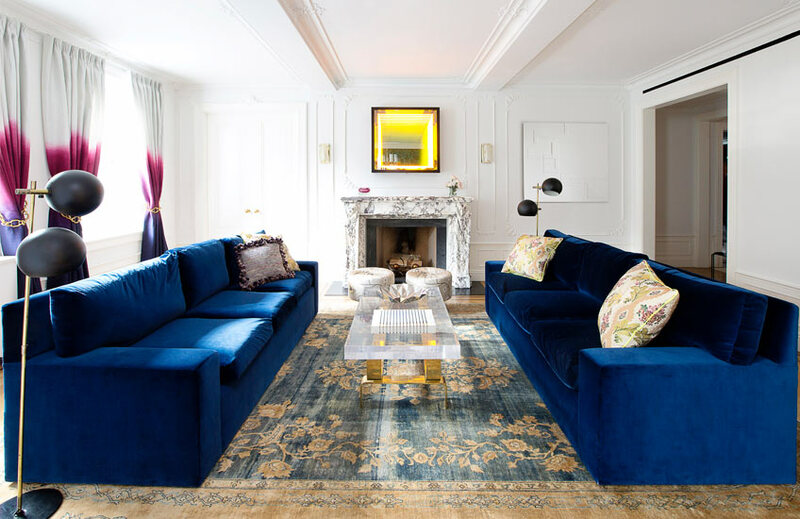 New York eclectic Fawn Galli tempered electric blue velvet sofas in a Greenwich Village project with a large-scale vintage rug. 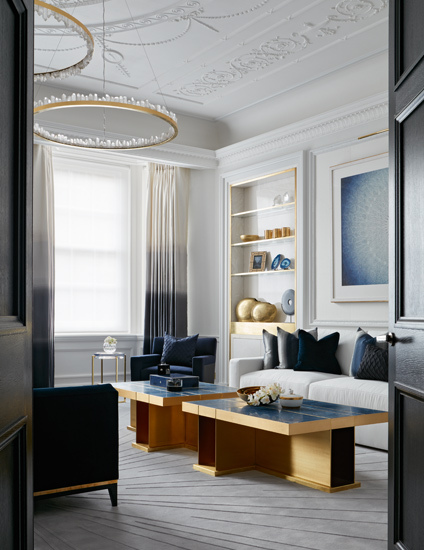 The design’s style and relaxed denim blue and biscuit palette adds just enough maturity to balance the room’s fresh decor – dip-dyed drapery (from deepest indigo to raspberry pink to powder white), a perspex-topped coffee table and Ivan Navarro mirror. 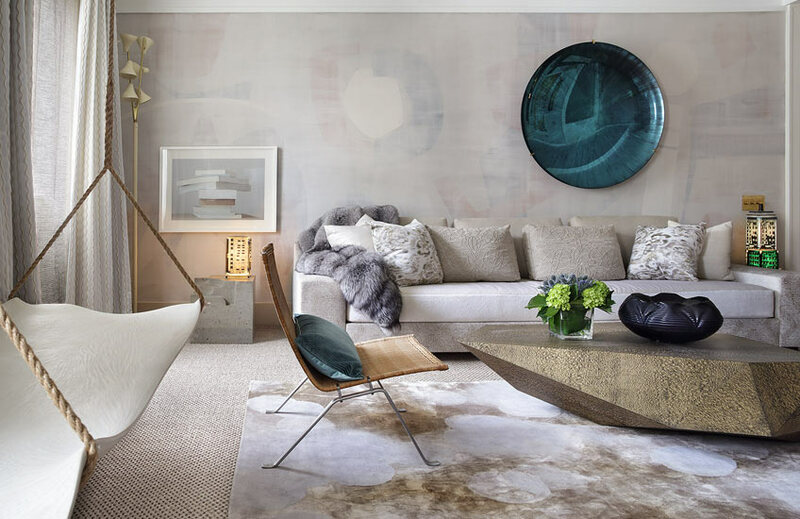 David Hicks recruits a large-scale, Japanese sayagata motif dimensional rug to add another texture to the living room of a light-filled Melbourne penthouse. Such a space runs the risk of feeling cold and unwelcoming but the careful choice of rug (which anchors the entire seating area), plush mid-century upholstery and Moroccanesque tray coffee table stylishly side step the issue. 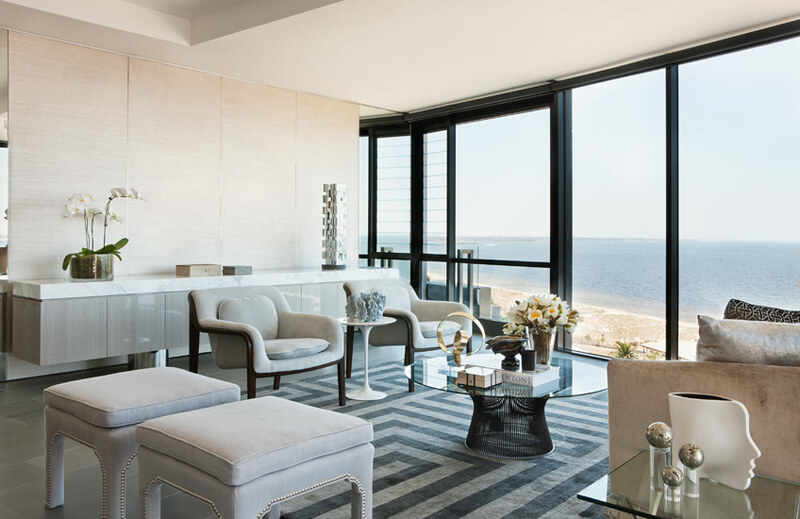 Brendan Wong creates harmony between this double height bayside living room and its lush green surroundings by bringing the outdoors in in the form of a Vivienne Westwood-designed rug for The Rug Company. A style osmosis to say the least. “The hints of emerald green and the magnolia motif in the rug enhances the connection to the garden and provides a dramatic base for the lacquered armchairs,” Brendan says. The design’s darker tones also successfully grounds the lofty room and offers an intimacy at floor level. 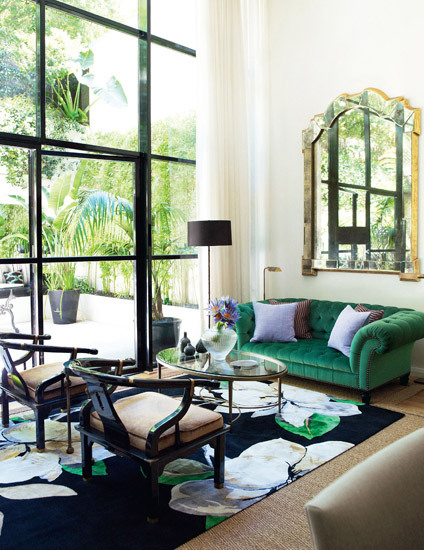 The rug’s emerald tones are mirrored in the vibrant Chesterfield sofa which sits underneath a gilded decorative mirror. Proving that statement can also be elegant, Hotel Bel-Air’s Chalon suite (designed by Champalimaud) showcases a loose lattice design rug. Its ivory and mocha hues tones down its striking pattern to decidedly sophisticated levels which enhances the suite’s classic modern style. 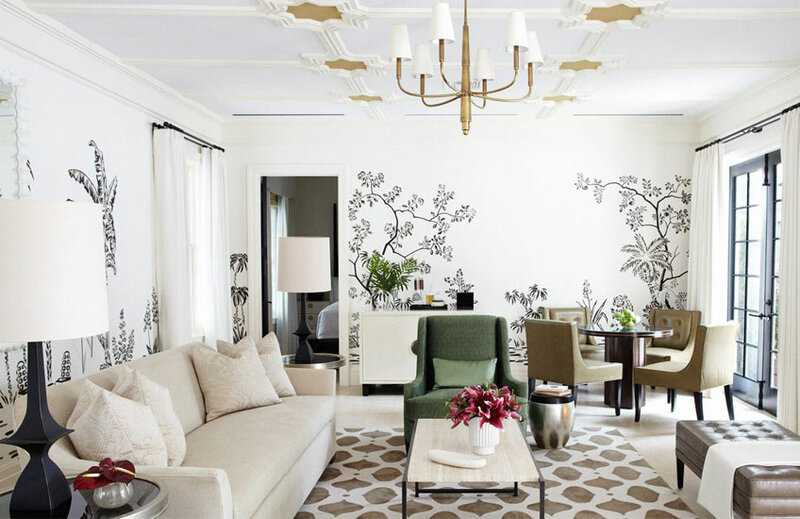 Pretty floral wallpaper and a coffer-like panelled ceiling are two of the room’s other stand out features. 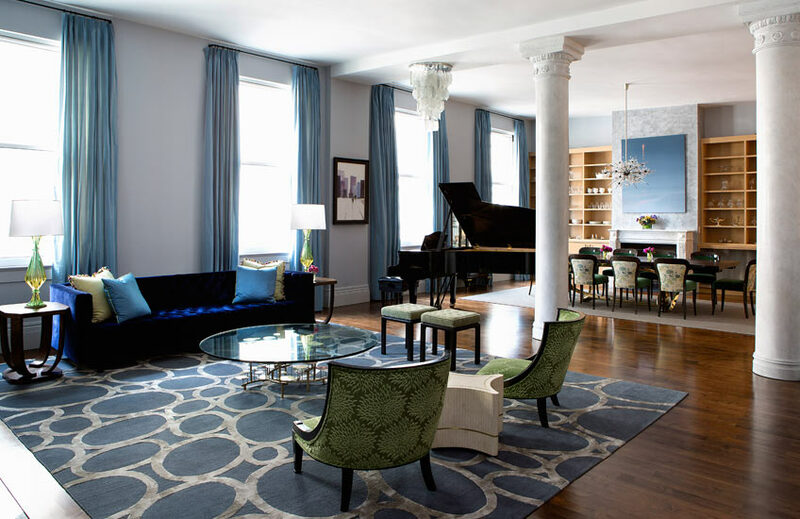 The contemporary elegance of an Upper East Side living room by Fawn Galli is established on the foundation of a distressed tapestry rug design, dominated by a double curve navy blue sofa and accented with mid-century lounge chairs and modern artwork. For her own home in Paris’ 16th arrondisement, Parisian designer Stéphanie Coutas finds her statement in a full-size damask “Versailles” rug design by Stéphanie Coutas and edited by Tai Ping. The traditional design is updated with a distressed finish and monochromatic colour palette and is accompanied by a palatial Baccarat chandelier, pillowy sofas with oriental tassel detailing and emotional artwork by The Kid. Oleg Klodt opted for a crocodile skin effect rug in this contemporary New York City bedroom. Adding a touch of glamour to the modern space, the design is realised in a muted two-toned silver palette which proves that statement can be subtle when done right. 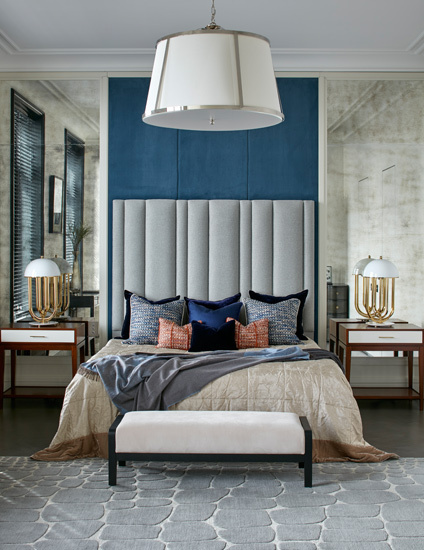 The design studio paired the design with a textured, quilted headboard in a coordinating colour, an oversized pendant overhead and Delightfull ‘Turner’ table lamps in front of antique glass panels. Sunny and vibrant climes are a sure bet for working a colourful statement rug. For proof, look no further than the living room of Stephanie Coutas’ Cannes project. The space is enlivened by a blue-hued design which recalls geometric modern art and is styled with generous upholstery, a wall of breezy white curtains and some Brutalist table lamps. A rug trend report of the last few years wouldn’t be complete without sculpted, dimensional creations. With its ray pattern, the soft grey design alludes to Art Deco stylings – an apt choice for this elegant living room which combines contemporary furniture with classic architectural bones. 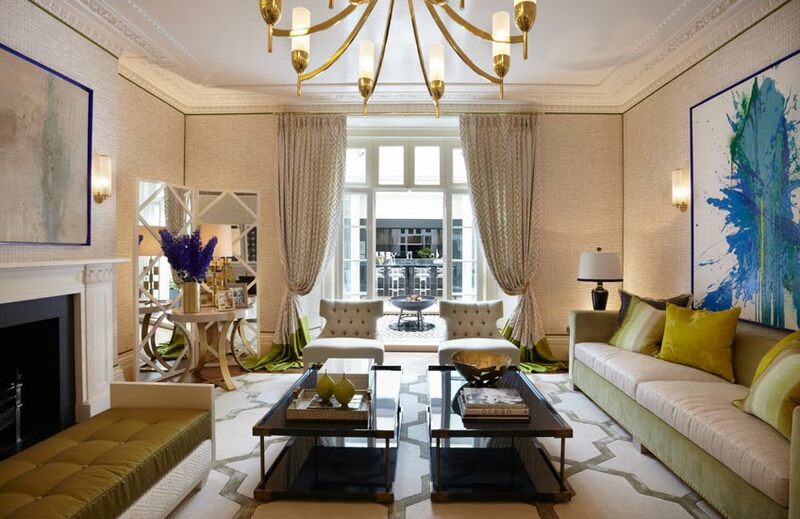 Combining a living room’s two predominant colours – moss green and neutrals – a lattice rug commands attention in this grand Belgravia residence. The elegant space (a creation of Helen Green Design) includes swathed printed curtains with wide trim, timeless button-tufted chairs, Helen Green’s Juno table and is offered an edge via gestural canvases. 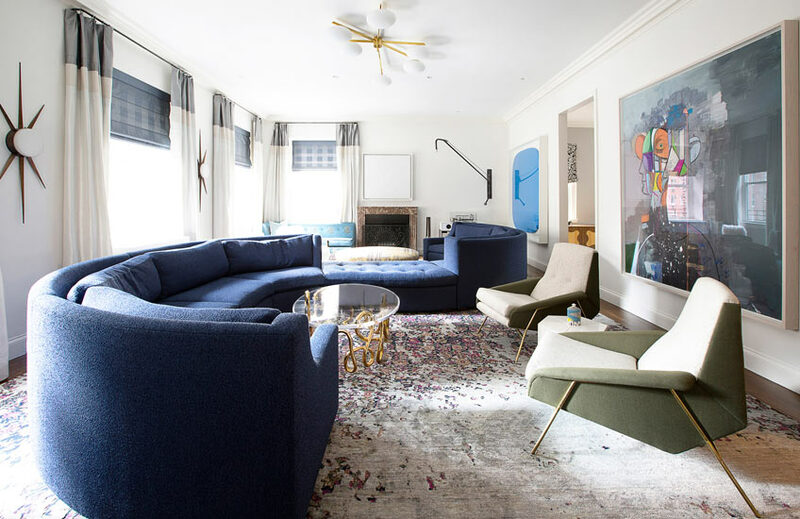 For the Deco-inspired living room of a family loft apartment in New York’s Flatiron District, Fawn Galli chose a Rug Company carpet designed by American architect David Rockwell. 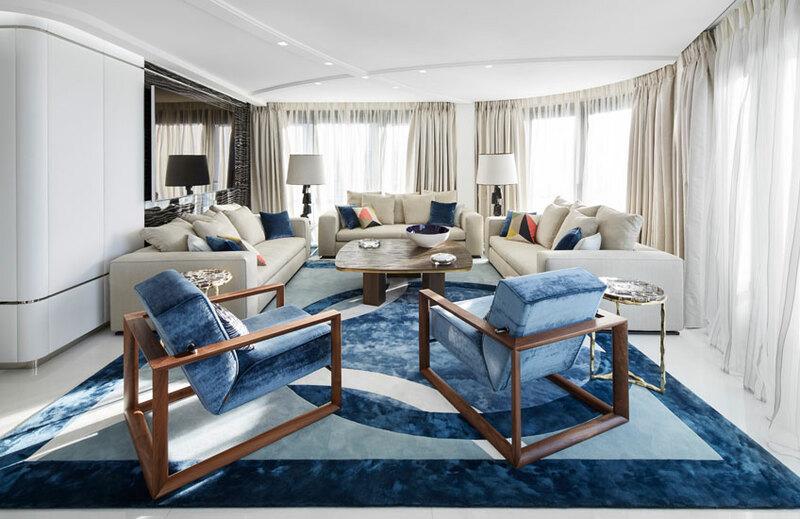 The hand-knotted Tibetan wool and silk rug’s silver and steel blue scheme grounds the airy space and creates a focal feature for a unique seating area. “This geometric pattern was selected to bring some movement and contrast into the room and pick up on the two tone wall colours in grey and white,” David Hicks explains. 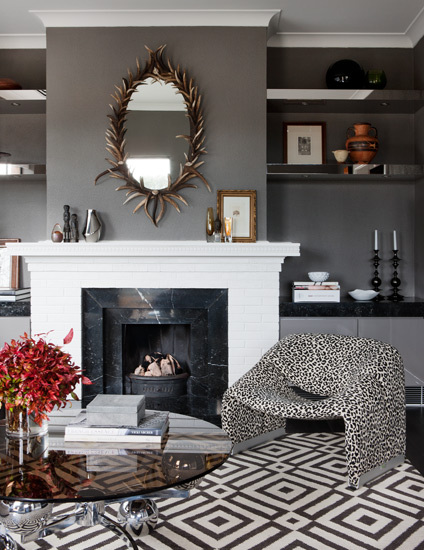 The designer teamed the design with an accent chair in a coordinating leopard print, mirror finish accents and an laurel-like antler mirror. "Unite clashing fabric styles with a harmonious colour palette for easy." styling. Of his affinity for statement rugs, Australian designer David Hicks explains, “I like to use large rugs in rooms so that all furniture sits atop them. I also like to use them as art pieces.” In his Port Melbourne project the designer used a geometric maze design which offers a directional element to the living room’s serene beach landscape. “The furniture in this space is all very neutral in tone so we used a darker geometric pattern to contrast with the more organic forms and textures,” David reveals.